The Fifteenth Judicial District Commission on Judicial Performance unanimously (10-0) recommends that Judge Debra M. Gunkel BE RETAINED. Debra Gunkel received her undergraduate degree from Colorado College, followed by an MBA from the University of Denver, a law degree from Southwestern University and an LL.M. in Taxation from Boston University. Before being appointed to the Baca County Court bench in 2010, she was with the 16th Judicial District Attorney’s Office. Her judgeship is classified as a "20 percent position" (in session one day per week). Judge Gunkel makes herself available to speak at public schools because she feels it is important for young people to learn about the judicial process. She also teaches business law for Lamar Community College. Judge Gunkel’s overall score from the surveys was 3.46 out of a possible 4.0 from attorneys, and 2.56 out of 4.0 from non-attorneys. The areas she scored most highly in on the surveys were appropriate demeanor, fairness, diligence and good communication. 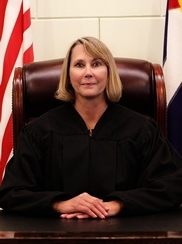 Judge Gunkel regularly attends training courses, judicial conferences and online seminars in order to increase her knowledge of law and improve her judicial abilities.